Halifax Share Dealing provides clients with a variety of tools for trading and research. And fees are low when using a regular investment plan. Halifax Share Dealing is a subsidiary of Halifax, a division of the Bank of Scotland plc, a wholly owned subsidiary of the broader Lloyds Banking Group, which is quoted on the London and New York Stock Exchanges and is one of the largest companies on the FTSE 100. Its ticker symbol is LLOY. Halifax is named after the town of Halifax in West Yorkshire, where it was founded in 1853 as a building society. Halifax Share Dealing was established when Halifax went public in 1997 and was the first in the UK to offer a regular investment plan called ShareBuilder through which customers could buy shares. Halifax Share Dealing is now based in Leeds and has over one million customers. Unlike most of the services in the UK online share-dealing market place, the Halifax Share Dealing service has a flat fee structure of £12.50 per trade, which is at the higher end of the industry standard. However, if the trader participates in a regular investment plan (from as little as £20 per month) dealing charges come down to just £2.00 per trade. Furthermore, it is the new standard in the UK to have either fixed or percentage account charges on trading accounts, together with charges for investments held in ISA and SIPP accounts. Halifax Share Dealing, however, applies no quarterly or annual administration charges for a standard trading account. That said, Stocks and Shares ISAs have a flat £12.50 per year admin charge and SIPP accounts have a quarterly charge of £22.50 (SIPP value of less than £50,000) or £45 (SIPP value of £50,000 or more). For traders willing to set up a regular investment plan, for investors who do not trade frequently, or for clients who have large portfolios, overall charges are certainly at the lower end of the UK average. 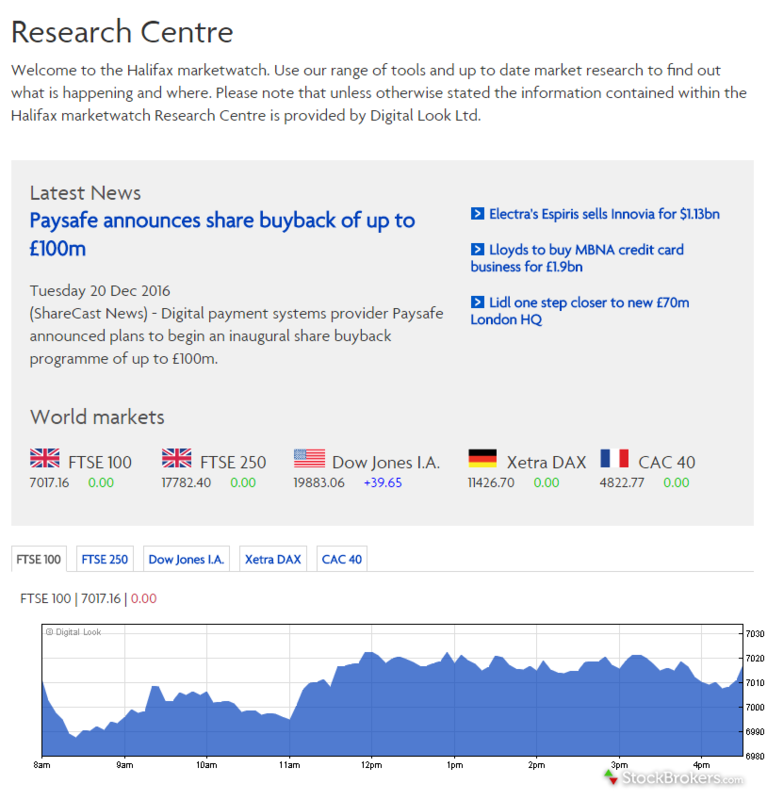 All of the research content – both news and company-specific research content – is provided by ShareCast, which is operated by Digital Look Ltd. Although this information is readily available for free, it was somewhat annoying that when viewing some research articles we were redirected to the ShareCast website. 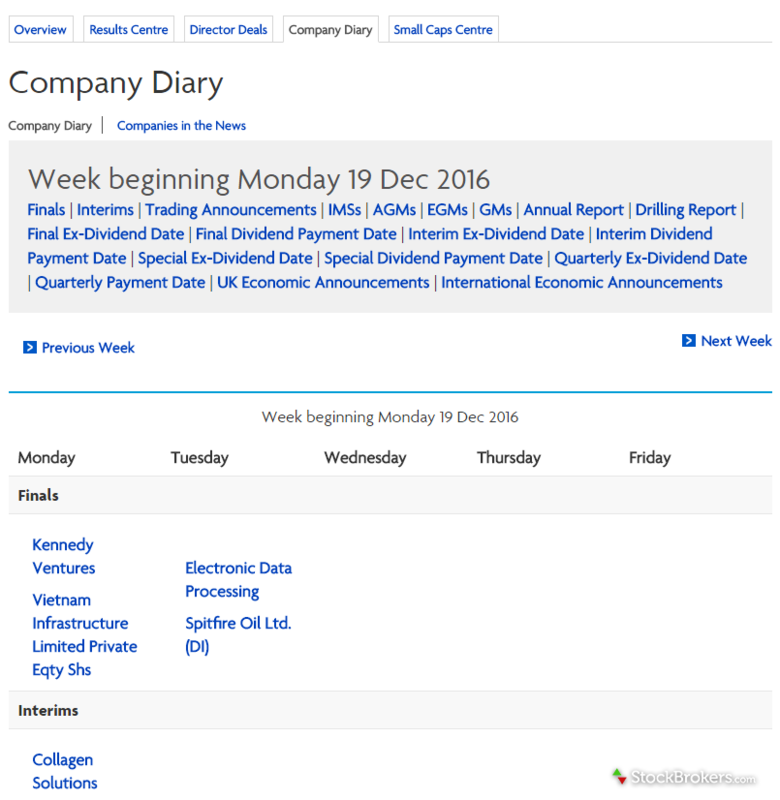 Two areas of particular interest are Company Announcements, which fall under Company News, and the Company Diary section. 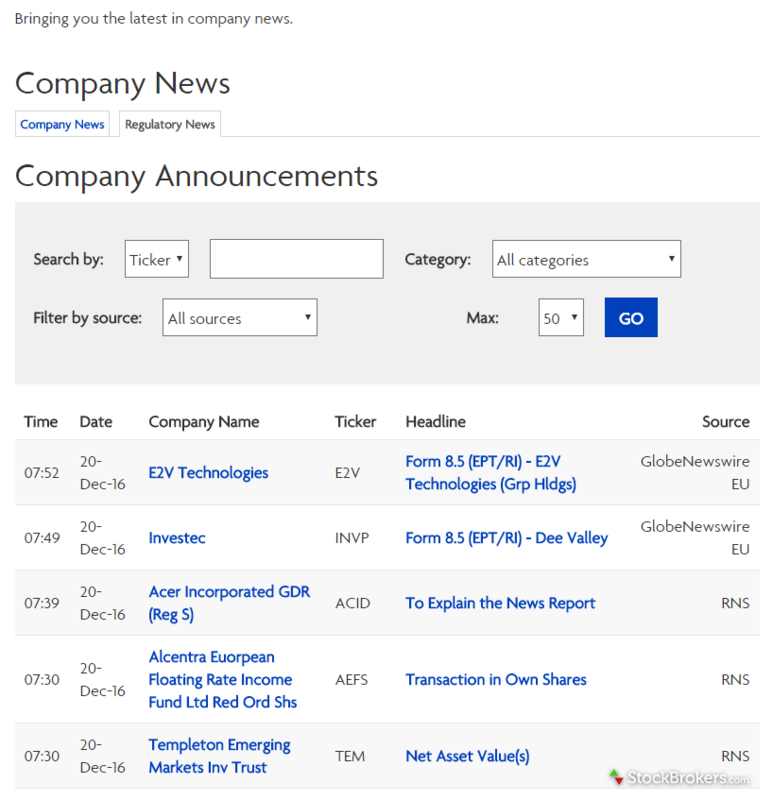 Both sections provide information relating to directors’ dealings, dividends, company announcements, and other pertinent company or trading news. The Company Diary is simply a calendar presenting the dates economic data are released and the data released on those dates. This data is displayed weekly and can be filtered by numerous parameters including annual reports, international economic announcements, finals, interims, etc. This is an important tool not readily offered across the industry in the UK. The research offering from Halifax Share Dealing is below the market standard as the absence of any independent research is disappointing. That said, the research offered is comprehensive, given the relatively low overall commission charges. The Halifax Share Dealing platform is certainly not at the pinnacle of offerings in the UK, but the platform sits slightly above the average, which is a particular positive, given the relatively low charges for regular investors or low-frequency traders. The individual share summary page is comprehensive as a one-stop overview, with both one-day and six-month basic charts, basic fundamentals for the past five years, recent company announcements and news, director deals, current market data, and recent dividends. 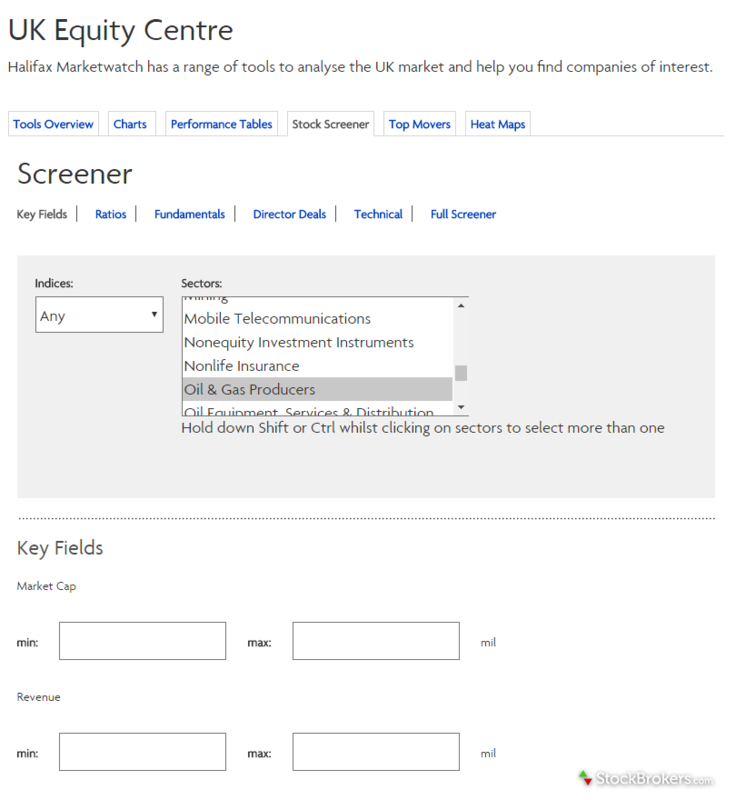 Furthermore, it is easy to add any stock to a watchlist from the summary page or to deal directly in a share. 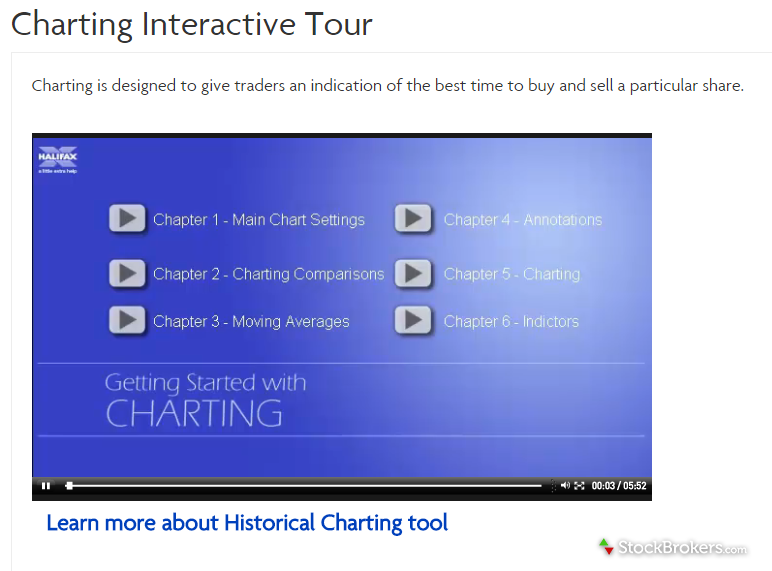 Again, the charting function was on par with the industry standard in the UK, enabling users to change the chart type (line, candlestick, OHLC charts) and to compare indices, sectors and other stocks. In addition, users can overlay three different moving averages and add in 40 different indicators. As with many of its competitors’ platforms, the Halifax Share Dealing platform provides performance tables for indices and sectors, and enables users to sort by various filters, including key fundamentals, financial ratios and directors’ dealings. Furthermore, the Stock Screener allows users to screen stocks and funds by various parameters. Finally (and somewhat in contrast to the rest of the UK market), the Halifax Share Dealing platform offers Heat Maps, which highlight key movers by index or sector, categorized by various metrics (share performance, technical analysis, balance sheet etc.) over different time frames. This adds significant value to the Halifax offering. Generally, we found the Halifax Share Dealing platform above the average offered in the UK market, which is particularly impressive given the relatively low fee structure. Halifax Share Dealing does not offer any dedicated applications on either smart phones or tablets. That said, there is a dedicated, responsive mobile site available. We found the mobile site functional, user-friendly and almost as good as a dedicated app. From the mobile site it is possible to access recent market quotes (with a 15-minute delay), to trade in UK stocks, to view the recent value of your portfolio (again with a 15-minute delay) and for clients to fund their accounts online. As stated, although the mobile site is not quite as notable as a dedicated trading application for mobile, it is effective and a net benefit to clients. Halifax Share Dealing provides a variety of educational content for its clients, but the articles do not go into any great depth. The education area is divided into sections, which include “Introduction to shares”, “Investment Companies”, “Unit Trusts”, and “Company Pages”. Within each of these sections are numerous individual articles, although each is limited to a very brief overview of no more than one or two paragraphs. 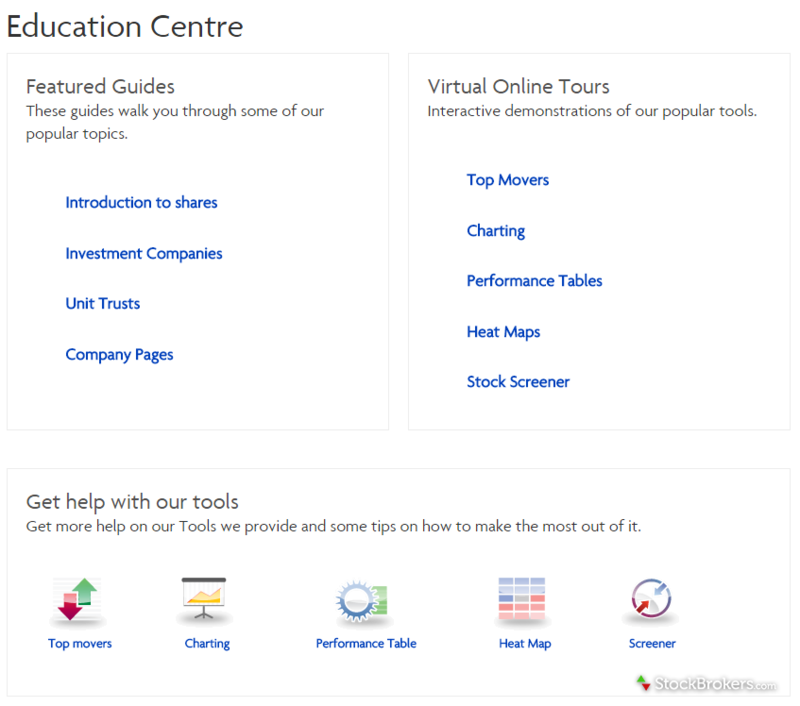 Articles aside, we were impressed to find five virtual online tours, which are interactive video demonstrations of the tools provided on the Halifax Share Dealing platform. We found that these would be extremely useful to novice traders and would even benefit intermediate investors. The videos were very user-friendly, concise and clear. Finally, there is a glossary section, which is broken down into a general glossary, fundamental glossary and technical and trades glossaries. We found these a useful addition to the education area. Although the depth of education is limited, for any novice traders or investors the breadth of Halifax Share Dealing is well above the UK industry standard. However, more seasoned clients may find the lack of depth rather disappointing. The Halifax Share Dealing service is attractive, given the long history of the parent company and being part of the Lloyds Banking Group. Although the research area and trading platform are below the average on offer in the UK online share trading market, the overall service provided is strong, given the relatively low commission rates, principally for larger investors or those trading less frequently. The bottom line? Halifax Share Dealing is a compelling choice for all UK investors. Select one or more of these brokers to compare against Halifax. Trading Fees (including UK or overseas shares, ETFs, gilts, corporate bonds and investment trusts). Find out how Halifax stacks up against other brokers.